Larger Project 5-4, Patio Space » Roger Perron Inc. This patio space provides an entertainment area at all times of the year with the built-in gas heaters above (one is shown). The hardscape is natural rock stone with random sizes and a gloss sealant. The very upscale overhead trellis is maintenance-free aluminum. 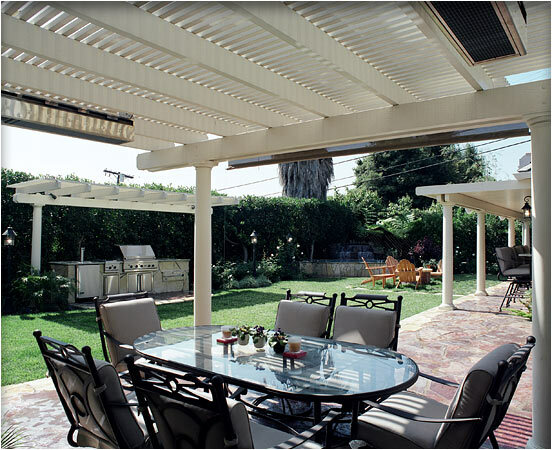 Notice the covered patio area over the indoor/outdoor kitchen (see photos #2 and #3). The wooden chairs in the center of the yard have a fire pit in the middle, a great way to entertain and to hold family gatherings and conversations.